BORP is very excited to announce that we were recently awarded a grant from the Craig H. Neilsen Foundation to develop and implement a dedicated outreach initiative to people with spinal cord injuries. The goal of the initiative is to increase their participation in programs that are centered around improved fitness and wellness. 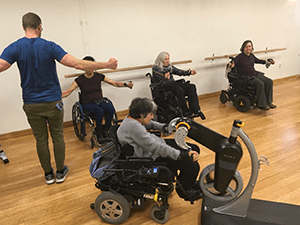 We will offer a menu of new ‘healthy lifestyle’ and fitness classes designed for individuals with SCI, but open to anyone, in our Adaptive Fitness Center at the Ed Roberts Campus. New classes and workshops may include chair yoga, upper body strengthening and conditioning. There will also be some dedicated cycling rides, outdoor adventures, and on May 19 we will host an Adaptive Sports & Recreation Festival at Aquatic Park, with opportunities to try out a climbing wall, kayaking and cycling. This effort is being led by Bonnie Lewkowicz & Cynthia Noonan, both individuals with spinal cord injuries. To sign up to be notified of SCI specific activities email bonnie@borp.org or cynthia@borp.org. We value and want your input! If you have a spinal cord injury please take this very brief survey that will help inform our program planning and ultimately bring you more opportunities to get fit and recreate. Take the survey.